My favourite muffin by far is Raisin Bran. It's not often that I eat them, a few times a year perhaps, but I have loved them since I was a kid and other then those couple of years when I was tempted by the more cake inspired blueberry muffins, my love has never wavered. 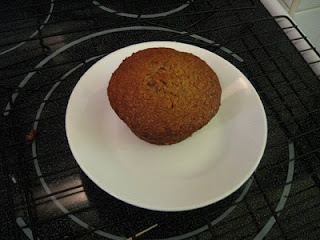 Strangely enough, and much like chocolate chip cookies, I have never actually made a Bran Muffin. I usually make banana or blueberry or some variation. My mother used to make box mix Bran Muffins all the time and I remember how great it was to eat them warm out of the oven. Maybe I didn't want to make something from scratch that wouldn't hold up to the boxed mix my Mother used. (That would hurt a bit :)). But this recipe (and my alterations) did not disappoint. 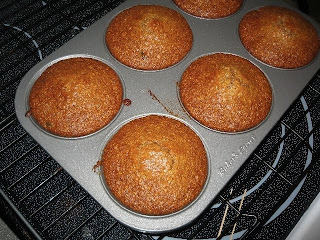 Since I have never made them and I wanted to REALLY enjoy them I decided that these muffins needed to be JUMBO (really the only thing better then a good Raisin Bran Muffin, is a huge Raisin Bran Muffin :)), something else I have never done. This also gave me the perfect opportunity to use my newly purchased Jumbo Muffin tins, and I am very glad that I did. As mentioned, I did play with the recipe a bit. I decided to decrease the sugar, I used dark brown sugar (which wasn't specified in the recipe), added some honey, increased the vanilla and bumped up the amount of raisins. When the muffins came out of the oven they were perfect. They were moist and fluffy and the taste was exactly what I wanted. Just sweet enough to compliment the sweetness of the raisins but not sweet enough to make you think “store bought”. One of the problems with eating certain baked goods warm is that not all of the flavours come through right away, so I'm not entirely sure how much flavour the honey added but I definitely know it didn't make things worse :). The ½ cup of raisins in the original recipe was really not enough, but I suppose that has a lot to do with how much you like raisins. I decided to add 50% more raisins (I'm like a President's Choice add) and to me (and my family) this was just the right amount to remind you that these were Raisin Bran muffins. However, I will also say that these muffins would be great without the raisins, something my brother requested for next time, which I am not opposed to in the least. (My brother's request was accompanied with a direct reference to that store bought mix I mentioned. I told you it was good :)). Unfortunately, I didn't get to have a muffin the next day since my parents decided to polish off the remaining two :) (I'm trying to be polite, I believe the correct term would be “scarf”). I was going out to eat pancakes anyways so it was probably best not to have a muffin the size of my face :) (especially because I was going to eat pancakes roughly that size :)). In a cup or a small bowl soak raisins in hot water for 10-15 minutes. Remove raisins from water and Fold into batter. Bake 20-25 minutes or until toothpick inserted in centre comes out clean, rotating pan when half done (mine took 22 minutes). Remove from oven and allow to cool on rack in pan for 5 minutes. Take a seat, a warm muffin, a nice coffee, and melt away. These do look good! Raisin bran muffin's are one of my favorites, but I've never tried it with applesauce or honey! I usually use molasses, but I will have to try these out. I'm always looking for a good healthy muffin recipe! Unsweetened applesauce is a great replacement for the fats in most quick breads/muffins, you can usually replace all or some of it in order to make a lower fat version. And careful when using honey it's 50% sweeter than sugar so you probably don't want a 1:1 :) (I've experienced this the hard way). Raisin Bran is by far my favourite, and this is my favourite recipe using oil or applesauce (though I have a long list of ones to try). I would like to try these for my friend. Would there be any alterations to recipe if I wanted to make them as regular muffins? Many tks for yr help. Your bake time would be slightly adjusted. Depending on your oven I would check them at 15 minutes, it will most likely take between 18 and 20 minutes. Other than that, you should be good to go :). Good luck! Where is the honey in the recipe? Could I use just white Splenda for a diabetic version?